I initially planned to do a vipassana retreat last month in Penang, Malaysia. But as it goes with plans it did not feel right, some things came forward and plans changed dramatically. Instead I ended up going to Singapore to see Sven Väth in Zouk. Vipassana and loud minimal techno, well almost the same thing anyway. However, three weeks later I found myself in a 10-days vipassana retreat taught by Steve and Rosemary Weissmann in Wat Kow Tahm on Koh Phangan. 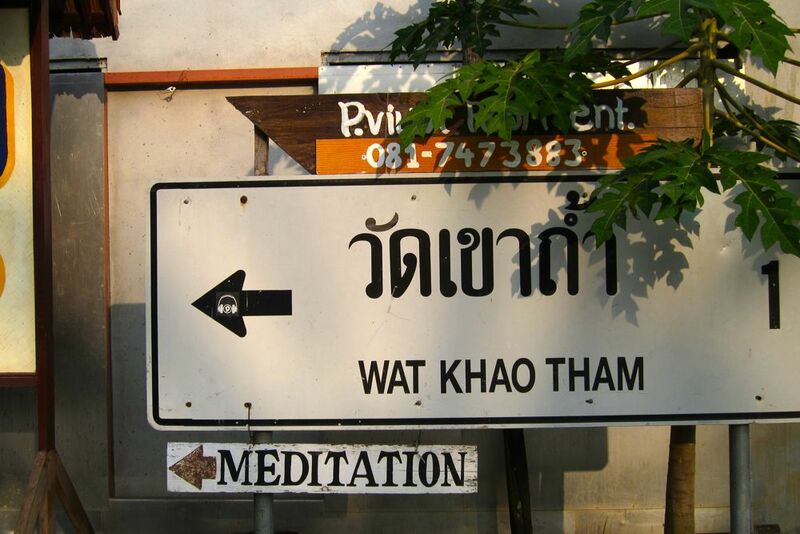 This time I was tempted to go to Koh Tao to see LTJ Bukem, but thankfully opted for meditation. This is my second 10-days retreat merely half a year later after Goenka’s retreat in Ödeshög, Sweden and this retreat was not as intense as the previous one. First of all, I knew what to expect. Massiveness of this project did not scare me off and I had a strong determination to use my time in the most efficient way. No slacking and no excuses, I came here to meditate and learn, take no prisoners attitude, period. Second, the retreat is really 8 full days, plus one orientation and one wrapping up day. Furthermore, it is really easy on your body, as it is a combination of sitting, walking, standing and working meditation. Tasks include sweeping, cleaning, doing dishes, preparing food, ringing a gong (mine was cleaning up and doing dishes after the evening dinner). And third, the structure of the daily schedule is designed to avoid building up too strong concentration, but rather the main emphasis is on building up mindfulness and compassion in daily life. The meditation technique taught is mental noting and basic meditation period is 45 minutes and the longest you are allowed to spend in one meditation form is one hour. I attempted once to extend a half an hour of sitting to one hour instead of switching to the standing meditation, but was quickly handed a no-no written note. One one hand, these factors make it easy for your body, but on the other hand it makes difficult to achieve deep concentration states. In contrast Goenka’s retreats are 10+2 days, offer only sitting meditation and you may spend as much time in one sitting as you want. The retreat last August was an extremely intense full blown spiritual high experience glowing with rather profound psychedelic concentration states. People were crying, going through a mental drama, having emotional breakdowns all over the place. Good stuff. No blissful raptures or dark nights of soul in Wat Kow Tahm apart from short periods of jhana states, but it was very beneficial in many other ways. I learnt way more here than in my first retreat, mainly thanks to versatility of the practice and excellent lectures packed with useful and practical information combined with top-notch performance and subtle humor. One of the main themes was to how to apply mindfulness and compassion in everyday life, not only in the context of the retreat. The content of the lectures is practice oriented with very little ideology related talk. Among discussed topics were compassion, five hindrances, dealing with physical pain, different meditation postures and other practical considerations. A personal highlight was the lecture on Kalama Sutta, which can be summarized as “do not believe anything blindly no matter where information comes from, but find out truth through your experience”. In contrast Goenka went into lengths dissing other spiritual practices, yoga and meditation techniques and stressing numerous times that his teaching was not sectarian or dogmatic, but rather the fact of life. This produced a rather unpleasant aftertaste of cult-like mentality and put me into the state of a cognitive dissonance for many days after the retreat. Me being part of a cult, which I can actually enjoy? Inconceivable! None of this type of talk was found in Wat Kow Tahm and finishing with Kalama sutta was a very nice touch. I had no after-retreat plans and was torn between several choices, but by chance found out that LTJ Bukem was playing in Had Rin the same day. This set plans in stone and I went partying the same day the retreat ended. This is what I call intense. Had Rin beach around 11PM was a bit too hectic for me, but thankfully the gig took place in an actual club far away from fear and loathing of the Had Rin beach. Quality drum & bass and nice atmosphere set things straight and was a nice and unexpected way to finish off the retreat. All in all, it was an excellent and beneficial experience and very different to what I expected before the retreat, which shows once again that plans and expectations are basically useless. The actual experience no matter what is most certainly going to be something completely else. Well written! I hope you don’t mind my forwarding it to a friend. Great post. I am going in a few weeks – any suggestions on what to pack? Mosquito repellent, a flashlight and a pair of earplugs. Hallo Roman! Nice reading. I am going to Wat Kow Tahm this year. After the retreat I am staying for some time on the island or some other place/island… nearby. Can you recommend some nice places? I recommend Hat Yuan and Hat Thiane beaches on the eastern part of the island. Good luck with the retreat.